Notes: Margin blocks of 4 with traffic lights. 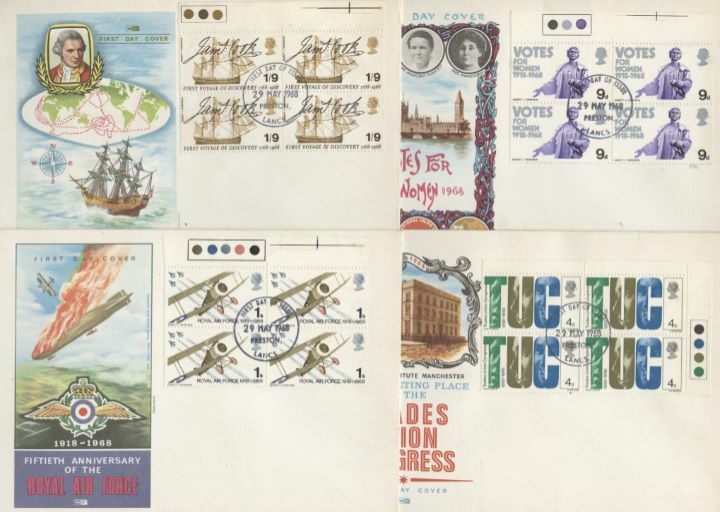 The above Royal Mail British Anniversaries stamps were issued on 29 May 1968 by Royal Mail and feature the following stamp designs: 4d TUC; 9d Votes for Women; 1s RAF; 1s 9d James Cook. The Set of 4 covers first day cover with the Preston FDI Postmark postmark has been produced by Philart and features these stamps which can make a very collectible and lovely gift.